Originally published in 1987, then translated into Japanese in 2000, and republished in English as a classic text of psychology in 2017, this book reveals: The substance and development of J. J. Gibsonʼs ecological psychology; how Gibsonʼs views connect with general philosophical issues in theories of knowledge and reality; and the historical context of Gibsonʼs theoretical position within psychology and the study of perception. 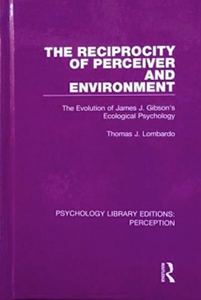 Included in the book is a detailed history of Gibsonʼs perceptual research and experimentation, as well as his philosophy and theoretical psychology. The book devotes considerable attention to the ancient Greeks, Medieval scholars, the founders of the Scientific Revolution, and early empiricist and Gestalt psychology. This in-depth historical analysis is included because Gibsonʼs theoretical challenge runs deep into the structure of western thought. Key concepts examined in the book include reciprocity, mind-matter dualism, perceptual systems, affordances, proprioception, space (surface) and time (event) perception, direct realism, stimulus information, the ambient optic array and the ambient environment, and the psychophysics of perception. The authorsʼ central goal is to set Gibsonʼs ecological theory within the historical context of fundamental philosophical-scientific theories and issues.